This expression might have been expressly written for Platinum Print’s newly-appointed managing director, Mark Plummer, for his career in the printing industry literally began in a basement. Mark takes over as managing director of the successful Harrogate print company, Platinum Print which this year celebrates 25 years in business. After 23 years working his way up at Platinum, Mark takes over from David Wyvill who, with wife Marina, set up the company. David and Marina Wyvill will continue as a crucial part of the Platinum team with Marina in her role as Financial Director whilst David looks at bringing more digital services to the company. 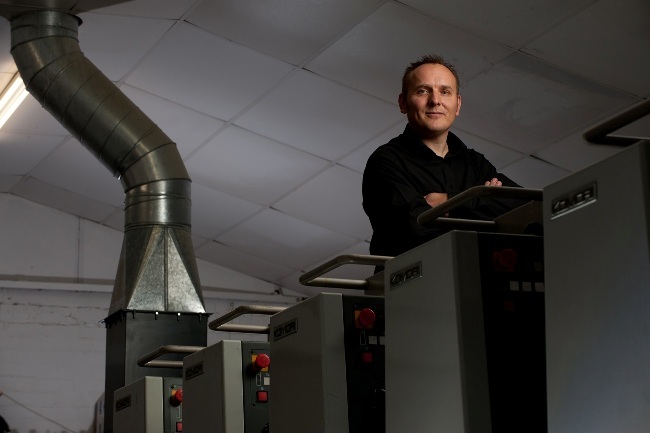 Although Mark did not join Platinum straight away, they kept in touch and eighteen months later he took up an offer to join the fledgling printing business in Harrogate. Platinum had been set up in 1988 in a garage behind Marina Wyvill’s father’s clock shop before expanding into a unit on Claro Road in Harrogate. By the time Mark joined, the business had moved again, this time to Skipton Street where there were now four members of staff. Having completed his City and Guilds printing apprenticeship, Mark set about learning his craft and from the start made it his mantra to be abreast of the rapidly-changing technology within the industry. “We see the communications industry as constantly evolving and the speed of change is increasing all the time. “It’s important to look at the trends and opportunities, making investments in new technology ahead of time rather than chasing the market when the industry has already started to move on,’ says Mark. As well as investing in technology, their design, marketing and in-house mailing divisions are testament to this strategy. The firm which has been at its Hookstone Park home for the last sixteen years has also made major investments in staff and training, achieving a number of industry awards and standards which set it apart from the competition. The firm’s green credentials are also a source of pride to Mark, from process-less printing plates which alleviate the use of thousands of litres of waste chemicals to the increased use of recycled paper products, £16,000 investment in energy-efficient LED lighting and even the recent purchase of electric delivery van. Mark’s optimism for the future of Platinum which celebrates its 25th birthday this year is well-rooted, having already achieved an increase in turnover of over £200,000 in the last three months over the same period in 2012. Mark now moves from production director to managing director where he freely admits he will be once again learning some new skills. “David Wyvill has been running the sales team as well as the business since it began and Marina’s financial control has been key to the success of the company’s success. “But staying ahead of the competition has been part of our strategy and that will continue. Being at the cutting edge of technology is a challenge we relish and it has paid dividends over and over again. Whitby’s Quayside chippie named best in Britain – twice!